A new LG device with the model number L423DL is likely on its way as the handset gets GCF certification. Is L423LDL LG Premier Pro LTE 2? In 2018, LG official released the LG Premier Pro LTE smartphone. The LG Premier Pro LTE comes with the model number L413DL, and it is now available from Tracfone, Straight Talk, and Net10. It is powered by Qualcomm Snapdragon 425 MSM8917 chipset, 2 GB of RAM and 16 GB of Internal Storage. We believe that the L423DL is the next generation of the LG Premier Pro LTE which will be available from Tracfone, Straight Talk, and Net10 in Q2 2019. 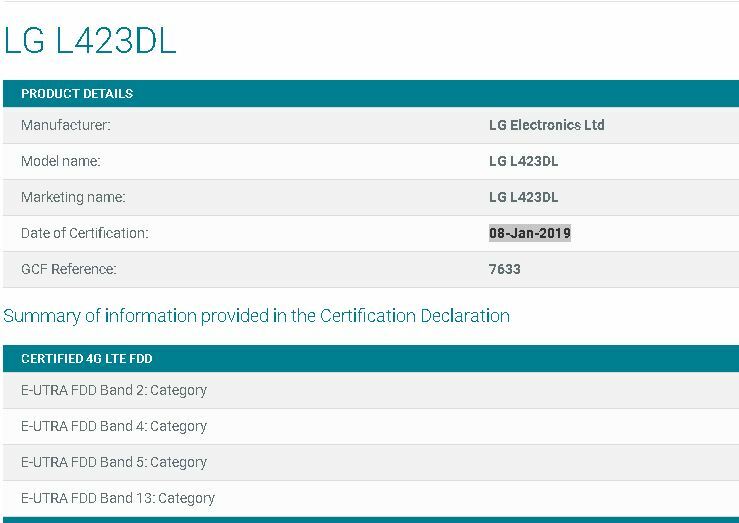 As per the GCF (Global Certification Forum) listings, the upcoming LG L423DL was certified on 08-Jan-2019. The device supports 4G LTE Bands 2, 4, 5, and 13. The specs in details for the L423DL was not disclosed by the GCF Certification. Maybe the phone will come with Qualcomm Snapdragon 425 MSM8917 chipset and 3GB of RAM.